The Omron 10 SERIES upper arm home blood pressure monitor has advanced features that provide users with detailed information to better manage their heart health. With a touch of a button, you can learn all you need to know about your blood pressure and be reassured you’re getting an accurate reading, thanks to the Calibration Check System and the Cuff Wrap Guide. 1-touch operation with up to 40% faster readings. Features hypertension indicator, morning hypertension indicator & irregular heartbeat. 2-person/200-total measurement memory with date & time stamp. Features 8-week morning & 8-week evening averages per user. Upper arm monitor is a irregular heartbeat dector.The Omron 10 SERIES upper arm home blood pressure monitor has advanced features that provide users with detailed information to better manage their heart health. With a touch of a button, you can learn all you need to know about your blood pressure and be reassured you’re getting an accurate reading, thanks to the Calibration Check System and the Cuff Wrap Guide. Detect irregular heartbeats while your blood pressure is being measured. If an irregular heartbeat is detected, an indicator icon will appear, alerting you so you can consult with your medical professional. Shows how your reading compares to internationally recognized guidelines for normal home blood pressure levels. Patented by Omron®, the pre-formed arm cuff expands to fit both regular and large sized arms to ensure more comfortable, accurate readings. AC adapter that plugs into your wall and ensures your monitor is ready to use whenever you are. 100 memory storage for each person (200 total) with date and time stamp allows you to review the last 100 readings with a touch of a button. What’s the Right Product for Me? 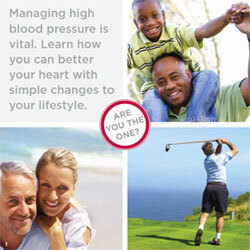 View Omron’s Blood Pressure 101 Brochure to learn more. Your heart is your most important organ, and it’s a good idea to know how well it’s doing. With Omron home blood pressure monitors, you consistently get an accurate picture of your heart’s health. One in three adults suffer from high blood pressure in America. This condition can lead to heart attacks, strokes, kidney failure, and blindness. With the Omron 10 SERIES upper arm blood pressure monitor, you can monitor your blood pressure at home, and with the help of your physician, take steps to decrease your risk of heart disease. A healthy heart combined with a healthy lifestyle will help increase your chances for a long, active life. View this chart to learn more about what the numbers mean. Understanding your readings is easy with the Omron 10 SERIES upper arm blood pressure monitor. The easy-to-read screen displays your readings in large font and labels each number with a tab along the side. Systolic Pressure is the top number on the display. It’s the pressure created as your heart contracts to pump blood throughout the body. Diastolic Pressure is the bottom number on the display. It’s the pressure between beats, when your heart relaxes. These numbers combine to give you your blood pressure reading (systolic over diastolic pressure). Your blood pressure numbers often change. For instance, your blood pressure in the morning can be significantly different than at night, when you visit a doctor’s office, or after exercising. By using an Omron 10 SERIES upper arm blood pressure monitor at home, you’re able to detect changes in your blood pressure any time you want. Place the blood pressure arm cuff on your left arm and sit quietly for approximately five minutes with both feet flat on the floor. Then, when you are ready to test, simply press the start button and the Omron monitor will do the rest. One Omron 10 SERIES upper arm blood pressure monitor (BP-785), one ComFit™ Cuff, one English/Spanish instruction manual, one Quick Start Guide, one AC adaptor, and one storage case.